There is nothing quite like a British summer picnic in the rain. Pitching a gazebo in the wind, weighting down your rug so it doesn’t flap and fly away, huddling in your fold-up chair, warming your hands on your thermos flask, all whilst wearing that defiant combination of a fleece and sandals. We braved it. Twice. Two days, two outdoor Fun Days, two picnics, two sessions of umbrella juggling, and two large helpings of laughs. Saturday’s function was a school summer fayre (which was at a posh private school, so included a proper stage with a pretty decent sound system and lighting). The music and dance acts included ex-pupils who had gone on to appear in the West End, a rubbish blues band and a Robbie Williams tribute act. The Fake That fella was cocky, hyperactive, and sang in a cheesy, fake-accented pub-singer style. So, pretty convincing then. My daughter took one look, and pronounced: “He doesn’t look like him.” She has a way with a pithy review. 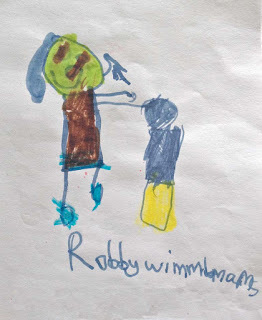 To illustrate her point, she drew a picture of what Robbie ‘Wimmlomams’ actually looks like. I think that’s the microphone he’s patting, and not a little Gary Barlow. Sunday was the main attraction, though. 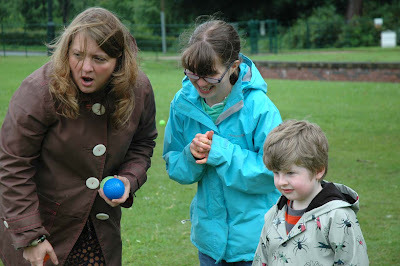 This was the Prader Willi Syndrome Association Family Day at Heaton Park, Manchester. An informal outdoor get-together organised by the PWSA (UK) where families could meet and chat and the kids could play games and have a picnic (the food bit came early on, obviously, what with it always being the most important part of the day for the grub-obsessed PWS children). We’ve been to one of these events before (see blog entry Picnic). And like before, when I met the children, who ranged in age and ability, I was acutely aware of both their uncanny similarities and their striking differences. Just like any bunch of kids. My girl, of course, loved it. She sat, grinning, looking shyly at the other PWS children. I walked her round with her notepad, and she took a register, asking the boys and girls their names and ages. This was as much for my benefit as for hers, as I knew she’d be questioning me for weeks afterwards about who was called what and how old they were. In retrospect, we should also have got shoe-sizes and number of teeth, as these are her other Important Facts To Know About People. What was I thinking? As the day progressed, I noticed that my daughter keep ostentatiously putting her Hannah Montana book in her bag and getting it back out to read, looking round her as she did. I realised that she was aware she was the oldest, and was showing off. “Am I the best reader, Mum?” she asked. She looked proud, and smug. As we walked back to the car, I asked her what she had liked the most. She said that it was seeing Will again, an adorable boy with PWS she’d had made friends with on an earlier trip up north (see blog entry Links). This time, they’d played boules together and Will hadn’t stopped beaming all afternoon. When you have a child with special needs it’s hard to put a price on the value of teaching assistants. But according to recent newspaper reports, the Treasury is looking to save money by reducing the number of TAs in classrooms. This report in the Sunday Times cites research by Reform, a right-of-centre think tank, which says it has found schools could ‘improve value for money by cutting the number of teaching assistants and increasing class sizes’. That’s a sentence that takes hold of your heart in an icy grip, isn’t it? I’m also not too happy with the sneering description of teaching assistants as a ‘mum’s army of classroom helpers’. Who do you think this is more insulting to - ‘mums’, or TAs? The idea that classroom assistants are ‘just’ well-meaning parents bumbling along helping the little ones with their crayoning is condescending, anachronistic and just plain wrong. 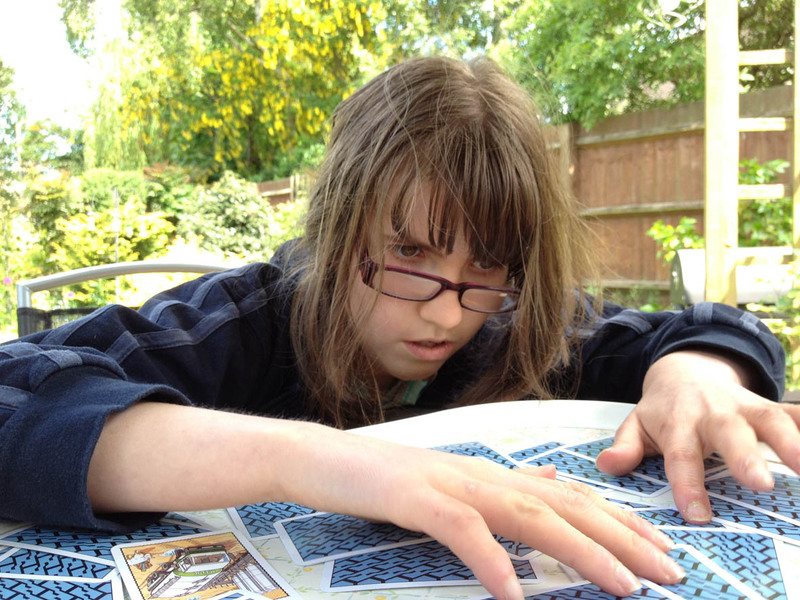 My daughter has been helped by teaching assistants throughout her school life, firstly with designated one-to-one hours at mainstream school, and latterly as part of her classroom staffing set-up in her special school satellite class. Her assistants have been dedicated, patient, enthusiastic, hard-working and skilled. They’ve also been trained to deal with everything a special needs child can throw at them. Sometimes literally. They don’t do it for the money - believe me, I’ve been a school governor, and I’ve yet to see any teaching assistant earning anywhere near the supposed £17,000 average wage cited in many of the newspaper reports. They deal with challenging behaviour on a daily basis. They get thumped, kicked, screamed at, and bitten. And they shake it off and go back for more, because they love helping ‘their’ kids. They provide practical, front-line support so that teachers can teach. It’s becoming harder and harder to gain dedicated support for children with special needs at mainstream schools, and yet at the same time the emphasis on integration is perhaps as great as it has ever been. And now some policy twonks (I'm guessing some of whom benefited from small class sizes at private schools) want to ‘improve value’ by making class sizes bigger and getting rid of TAs. Maybe someone can reassure me that teaching assistants with responsibility for special needs children will be unaffected by any cuts. Can someone do this? Please? When you have a child with special needs it’s not just hard to put a price on the value of teaching assistants - it’s impossible. I've been looking up types of waves. Breaking Waves are formed when the wave collapses on top of itself. Plunging Breakers reach steeper beaches and curl, moving very fast. Spilling Breakers disperse their energy over a large area. Internal Waves are high and become turbulent currents when they hit a land mass. Tsunamis are caused by earthquakes and are dangerous and devastating. My daughter occasionally gets swamped by her emotions. We say it’s like a wave hitting her. Sometimes you can yank her out quickly onto dry land, sometimes you have to wait until the tide goes out. Thanks to my less than exhaustive research on wave vocabulary, I can now describe the tidal phenomenom which affected her today. It was a Refracted Wave. Definition: a wave that travels in shallow water decreasing in power, curving gently. In other words, a littl’un. It was a tiny pebble that started the ripples. And yes, it was, as it often is, my fault. Her school tie is blue and black stripes. 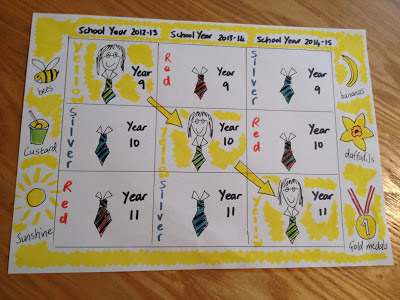 But Years 9, 10 and 11 actually have slightly different versions: hers, in Year 9, has a thin gold (or what she insists is yellow) outline on the black stripe, but Year 10's has a silver edge and Year 11's is red. Clear? Are you following this? I assumed that the colours were permanently allotted to the Years (and suspected it was a moneyspinner, to make you buy a new tie every September). But I was wrong. My girl discovered today that the outline colour stays with you throughout your time at school. 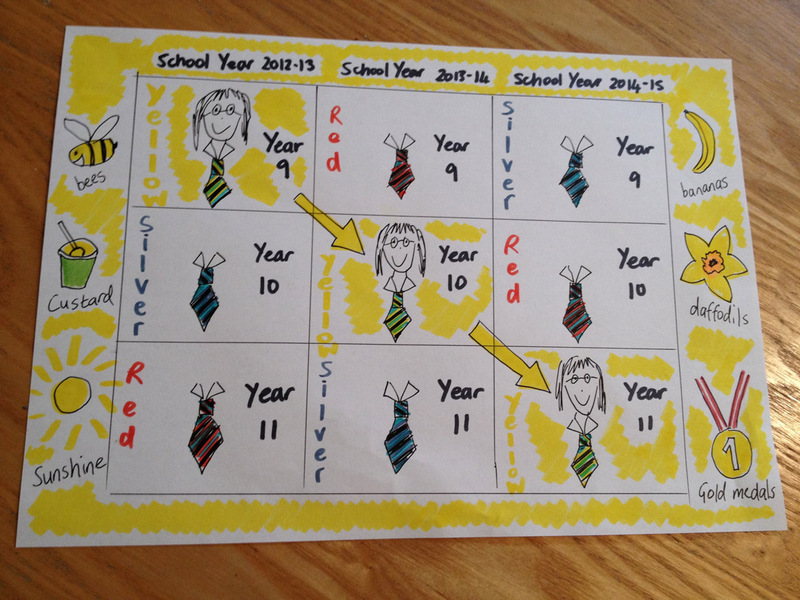 So the yellow edged tie will go up to Year 10s next school year, and Year 11 the year after. Are you still following? Let me put it simply. You only need one tie. You don’t buy a new, slightly-different coloured one each year. Like I’d told her. Her orderly expectations of How Things Are And Will Be had been disturbed. The teachers calmed her down and tried to explain. They even did a picture to try to help her visualise it. But what it needed was a super-duper chart (see above, preferably whilst wearing sunglasses). We got the felt tips out when she got home. The design was a little ‘busier’ than I’d planned, after we decided to decorate it with yellow things she likes. But I think she’s got it now. Video is Throwing Muses - Bright Yellow Gun. No big lyrical connection with today's post, apart from the colour reference. But come on, be honest, it's got more get up and go than Coldplay's Yellow, hasn't it? It took a few days. 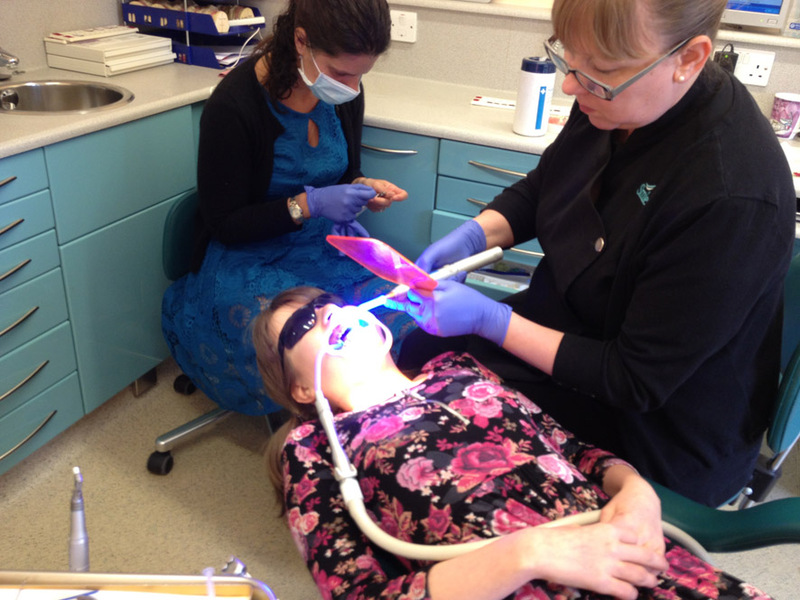 Soothing, saving, sleep came; smiles returned; and she started to acclimatise herself to her new dental brace (refitted without drama, fuss or agitation on Monday after she'd succesfully dismantled it at the weekend). Her teeth were no longer her main focus - buzzing insects were. You may think that the sunshine we’ve been experiencing this week was the signal that summer is finally here, but it wasn't. We work to our own almanac: summer arrives precisely when my daughter starts obsessively discussing the evil nature of wasps. Which she did, repeatedly. The insect-based refrain is refreshingly, comfortingly familiar. I can fire off my answers to her questions like a sharpshooter, knowing exactly what she wants me to say. "Yes, that's right, we love bees because they make honey, no, nobody really likes wasps, no, they won't sting you, not unless you tread on them or really annoy them, yes, your cousin got stung three times, no, I've never been stung, and yes, yes, I think you're right, wasps are evil." I stood watching her today, at the special school’s garden party, just for a minute. I was there to take photos for the school newsletter (the party had been organised to celebrate the head being awarded an OBE earlier in the year). I’d even worn a frock for the occasion, a wardrobe choice usually strictly confined to weddings, christenings and funerals. My daughter was in her best flowery dress. She caught my eye, then dipped her head, grinning shyly. I snapped the picture, above, then walked across to her and pushed her glasses up from the end of her nose. She was back. My girl had reappeared like the sun, startling and tingling my skin. I let the light wash over me. 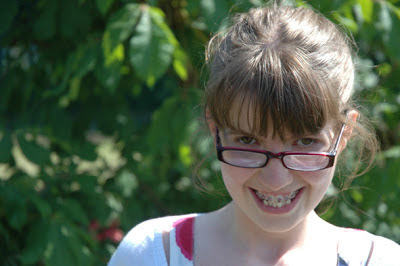 And squinted a bit, dazzled by the disco pink bands of her braces. Video is Madonna - Ray Of Light. "And I feel/Like I just got home." You hear about these metal thieves, nicking road signs, piping, and wiring from remote locations for its scrap value. Well, maybe my daughter has identifed a future career path. Her brand new brace is no longer intact. This morning, shortly after writing a blog entry here about her first set of braces, and just under three days after the scaffolding was put up, I noticed something odd about her new tooth furniture. Half of it was gone. All of the wire, threaded horizontally across her upper set of teeth, attached and anchored by the small squares of metal glued on to her choppers, had disappeared. A couple of the squares on the back teeth were also missing. The rest remained, like tiny symmetrical islands. The ‘bridges’ between them were AWOL. Absent most bloody definitely Without Leave. “Where are the bits from your braces? Where’s the wire?” I asked my daughter, the panic rising in my throat. One look at her exhausted face told me I wasn’t going to get any sense out of her. She was at the latter end of one of her sleepless weeks, and basically in a trance. When I asked her if she’d pulled off the wire with her fingers in bed (was that possible? ), or yanked it off with a toothbrush in the bathroom), she replied “Yes.” To both questions. I stripped her bed, got on my hands and knees, scoured her bedroom floor, emptied the bathroom bin, checked the sink, peered down the loo, and searched anywhere I could think the bits of missing metal might be. Because the alternative was dawning on me. There was no blood, which was slightly reassuring, but at moments like these the high pain threshold that comes with Prader-Willi Syndrome was uppermost in my mind. Could she? Might she have? Had she swallowed them? A couple of hours later, after a visit to A & E, an examination, and an X-Ray, I got my answer: no. The NHS staff were all wonderfully friendly, reassuring, caring and knowledgeable, which made me feel less embarrassed about what was, in the end, a waste of their time. What was always more likely to have happened must have happened: the bits of wire must have been washed down the sink or flushed down the loo. The photo at the top of the page is my daughter, playing ‘pairs’ in the garden at Nanna’s house this afternoon - a game where she normally lines up the cards in meticulously neat rows. It doesn’t really look like her. This is the mildly catatonic state she ends up in after a batch of sleepless nights; this is where we’re at now. We’re back to see the orthodontist tomorrow. I’m not sure how she’s going to cope. I’m not sure what the plan is going to be. My daughter now sports some more metalwork to go with the titanium rods in her spine: a set of disco pink braces adorning her top set of gnashers. The fitting went smoothly. My girl was biddable and compliant, despite a ragged couple of nights' sleep. The orthodontist and dental nurse were like a Formula One pitstop team, working swiftly and efficiently to fit, adjust and tighten, then wave her off. (They didn't actually have flags). Before the appointment, I’d tied her hair in two bunches at the sides rather than her current preference for a ponytail at the back, thinking it might be more comfortable for her as she lay on the dentist’s chair whilst her braces were fitted. So as I helped her up, and she gave me a big smile to show off her new fretwork, a thought suddenly popped into my head: she looked like the love child of James Bond’s steel-toothed enemy Jaws and his diminutive be-pigtailed girlfriend Dolly, in Moonraker. We’ve had a ropey couple of days since. The braces obviously feel odd, and although she’s been insisting - with monotonous regularity - that she likes them, my girl has struggled with how they feel inside her mouth. She’s been doing the night-time wandering around in a daze thing, which means she’s been dog-tired in the day, which means she doesn’t take in any instructions from me, which means it's been a bit wearing. My efforts to tell her to try to eat normally, close her mouth more so she doesn’t dribble, and not to stick her fingers in her gob and fiddle, have had to be repeated over and over again, sometimes with me holding the sides of her face and telling her to look at me as I try to hold her darting, flitting gaze for just a few seconds so she can listen. I realised too that her habit of wringing her hands together right up against her face with her head leaning slightly forward means she is actually pressing her mouth against the metalwork inside, which is going to cause some soreness and bleeding if we don’t keep on top of it. We need to try to ensure she has something in her hands she can tinker with, and displace the movement to a safer position. Then there’s the cleaning, a process for which the word palaver seems to have been invented. Removing the gubbins stuck behind the wire and metal joints is no mean feat. We are now armed with a special toothbrush, a tiny wire brush thingy to poke under and around the hard-to-reach bits, and instructions on swilling, rinsing, and spitting. At the moment I’m having to do the mushed-up food removing duties, as in her insomniac space cadet mode, she’s too jittery and distracted to even attempt it. When she finally gets some sleep, and I give her a few lessons, we’ll see if she has the dexterity and concentration to manage it. (Close supervision is, I’m sure, going to be needed). She needs a little time. She needs to get used to it. Then in six weeks, she’s getting another set for her bottom row of teeth.